Week before last my husband had major surgery on his neck—he had two disks replaced and three vertebrae fused together. He’s had to wear a Darth Vader-looking neck brace and was instructed not to stoop, twist, turn, bend, lift, lean or lay more than 30 degrees in any direction. So I, of course, embraced the role of caregiver, as well as chief cook, washer, bather, errand runner, house cleaner, and encourager. I also brought work home to ward off falling behind on my deadlines. No problem, I thought, I am good at multitasking and I like to serve (especially someone I love). But by mid-week last my usual sense of control and tower of strength crumbled, and, piece by piece, it fell into an abyss of weariness. My spirit felt defeated and exhausted. I actually felt bewildered—so very unusual for me. As my inner crumbling started, I couldn’t help but think of what full-time caregivers face. The mom of a special needs child; the wife or husband whose spouse has a long-term illness or handicap; the adult child who cares for their aging parent. Every single day is filled with constant tending to the needs of another, with no break, let alone time for them self. I’ve only had a taste of what they go through day-to-day, and I found myself teary eyed with new-found compassion. They have captured my heart. They have my grandest wishes for all the hope they can find for respite, for a helping hand, and for physical, emotional, and spiritual renewal. They are all heroes in my eyes and, hopefully, the eyes of those they care for. During one night of calling out to God, Psalm 34:18 came to mind. I clung to the words because, well, deep in my heart I know they’re true: The Lord is close to the brokenhearted and saves those who are crushed in spirit. (niv) Even though my heart isn’t really broken (my husband’s condition is temporary), I know that there are many caregivers whose hearts are. I imagine they have a list of broken dreams and visions of what they thought life would be like before their new role. And if they’re like me, they’d have broken hearts for the person they are caring for—surely the afflicted have dreams that got shattered or wiped off their road map of life. But we have the lasting hope and comfort of knowing He is near, and that alone is enough to get each of us through another day. By this last weekend Steve began to show sudden and great improvement. A bright new light began to shine on both of us—we knew we were both moving on to healing and relief. So to celebrate the week on a high I asked Steve what he’d like for dinner, and he said “Stroganoff! 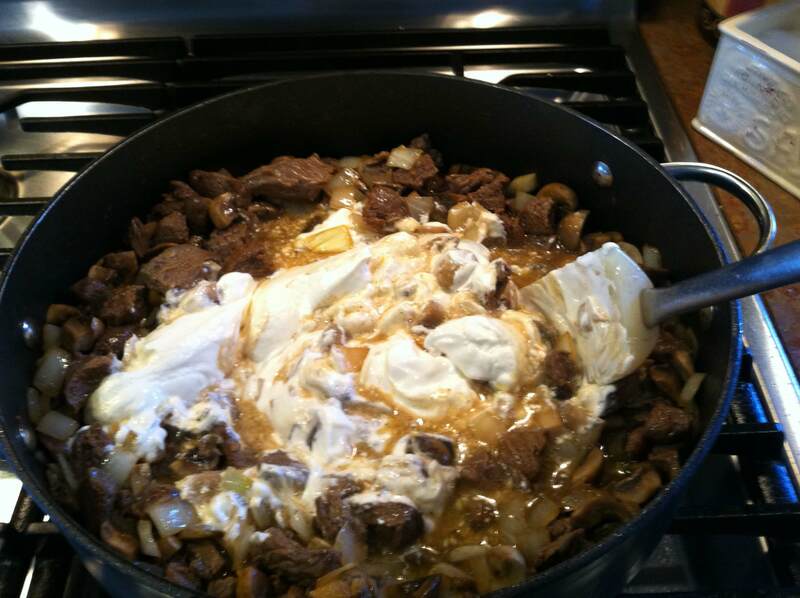 I would love a bowl of your Beef Stroganoff!” So that’s what I made. It’s normally something we enjoy in the fall since it’s so rich and creamy, but this would be a willing exception. And I even took pictures and wrote down my recipe so I could share it with you today. I must say, it was delicious, and it was especially grand to see that ear-to-ear smile on Steve’s face while eating it. 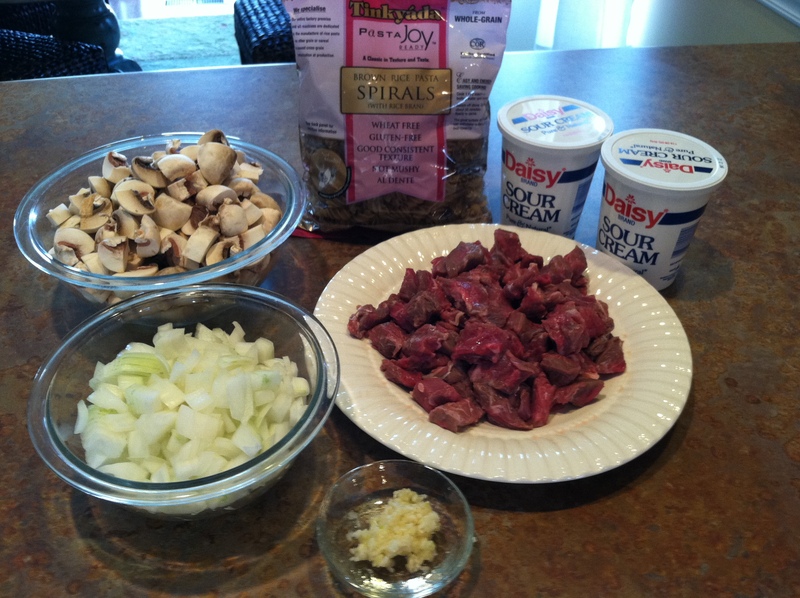 So here you are, my Beef Stroganoff, gluten-free of course. And maybe when you give thanks for what you are about to receive, you can offer up a prayer for any caregivers you know. Maybe even take them a batch to lighten their load for one evening. 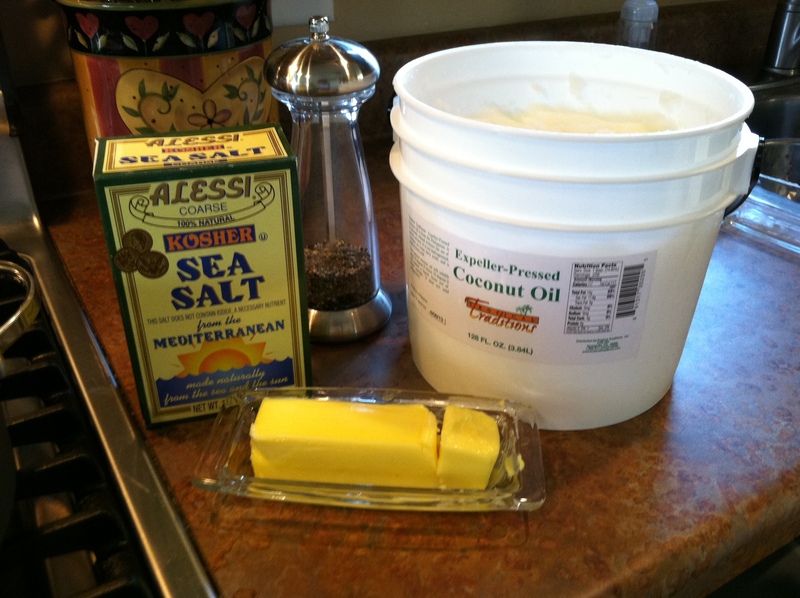 Melt about 2 Tbsp coconut oil in a large skillet on high heat. 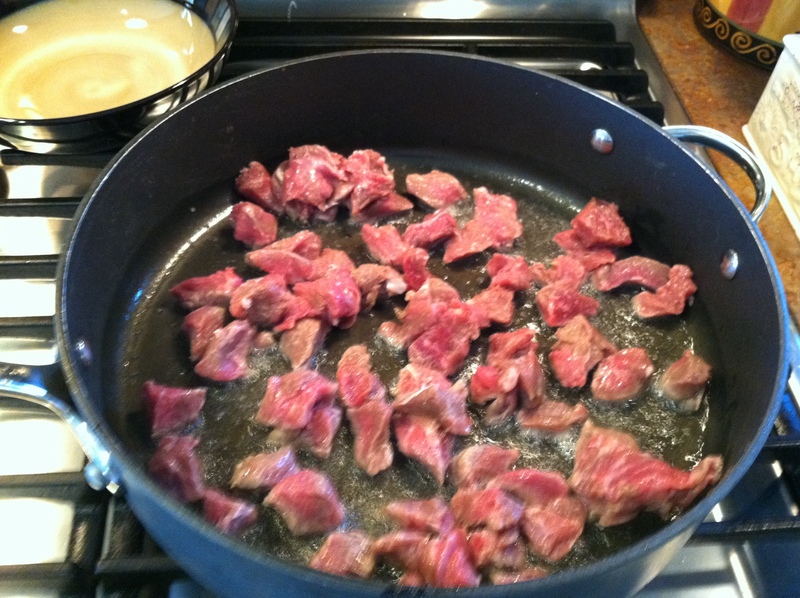 After the pan is really hot, add 1/2 the stew meat and let sear for about 2-3 minutes without stirring. Sprinkle with salt and pepper. Once the meat turns crusted and brown on the bottom, give a quick stir to cook for another minute. Remove meat with a slotted spoon and set aside. (It’s okay if you still see a little pink—the meat will continue cooking.) Add the second ½ of the meat and repeat. Right before you give the meat a stir, add the minced garlic. Stir and let cook for about a minute. While it cooks, turn the burner down to medium. Remove meat and set aside. 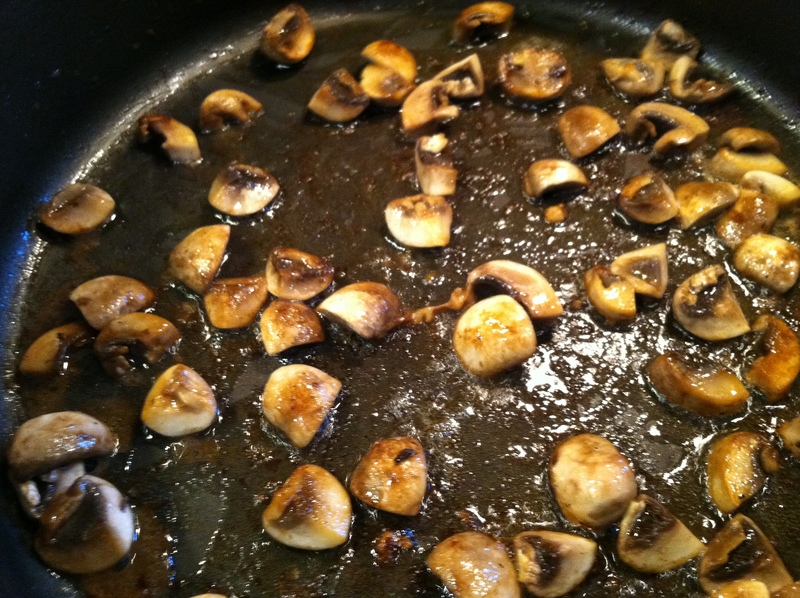 Now sauté the mushrooms, adding butter as needed, until they are a rich brown color. (I cooked my mushrooms in 3 batches so as not to crowd the pan. You don’t want them on top of each other or else they won’t brown properly and produce the rich and toasty flavor you’re looking for.) 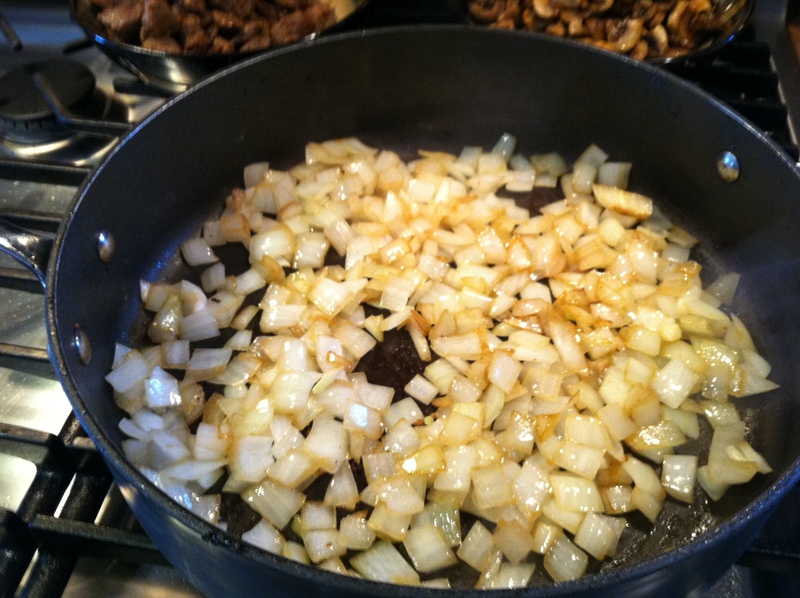 Once the mushrooms are done, add more butter as needed and cook the onions until they begin to turn translucent. When the onions are done, turn your burner to med-low and add the meat and mushrooms back into the skillet, along with the beef broth, and stir. When the burner temp has had a chance to reduce, add the sour cream and gently stir to mix. The sauce will be slightly too liquid for clinging to your pasta, so, in a measuring cup, add enough water to your GF flour until it’s the consistency of pancake batter—easy to pour but still thick. Mix until there are no lumps. Add a little of the batter mixture at a time, stir, and wait to see your sauce thicken. Add batter until the sauce is a nice and rich consistency. Add salt and pepper to taste. Spoon over your pasta and enjoy! 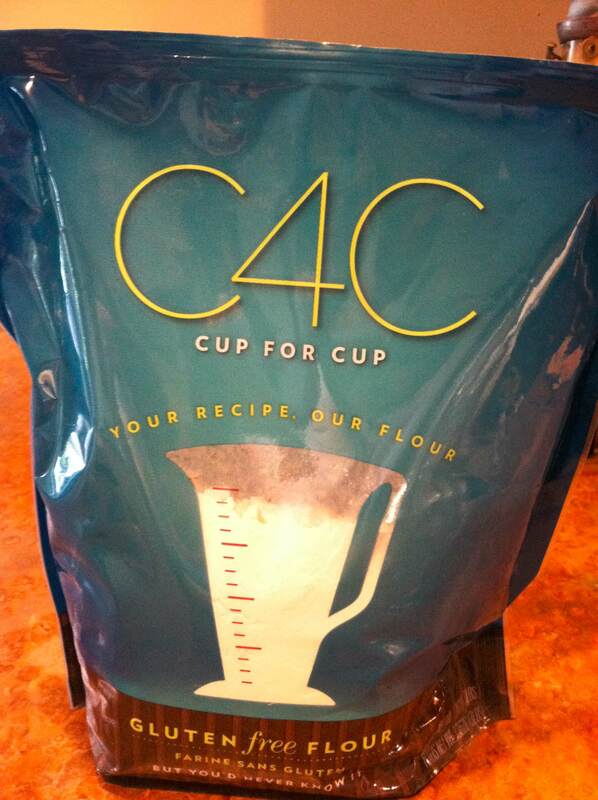 This entry was posted in gluten-free and tagged Caregivers, gluten-free flour by lstilwell. Bookmark the permalink. OMG. This looks so insanely good. I may have to add it to the cooking queue for the weekend. Thanks, Lisa!